Support Cameroon's trade unions against state repression! Cyprus bows to the Troika. What will the Greek left learn? Rail cleaners across several lines and contracts will take unprecedented strike action on Thursday 29 November, Friday 30 November, and Saturday 1 December. The strike, organised by the Rail, Maritime, and Transport workers union (RMT) is the widest coordination of cleaners’ disputes in recent labour movement history. The posturing, demagogy and manoeuvring which could bring Britain stumbling out of the EU are driven by the Tory right wing. That is no paradox or aberration. Some people still think anti-EUism is a left-wing cause — like the Socialist Party and the leadership of the rail union RMT, who in 2009 ran an electoral coalition named "No2EU". In fact those left-wingers are making themselves helpers for the serious anti-EUers, the Tory right. The Israeli government and Hamas, the Islamist party that rules in Gaza, are continuing talks over the implementation of the ceasefire deal that ended Israel’s recent assault on Gaza. Over 150 Palestinians, including dozens of children, were killed by Israeli bombing. Six Israelis were killed by rocket fire from paramilitary Islamist groups within Gaza. 29 Israelis were also injured in a bus bombing in Tel Aviv. Teachers’ national action over a number of issues, including workload, continues, with the industrial action escalating to strikes in a number of schools. Teachers at Stratford Academy, where management has imposed a 15% pay cut on workers taking part in action, struck for three days from 13 November, with more strikes on the way. A parents’ group has been formed to support the teachers and demand that school management withdraws the pay cut. Cleaning workers in the Industrial Workers of the World (IWW) at John Lewis stores in London recently won an important victory when their threat of industrial action secured an immediate and backdated 9% pay increase. 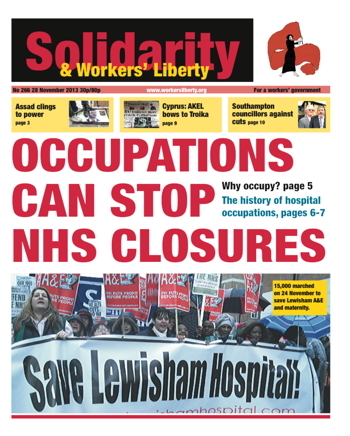 An IWW organiser spoke to Solidarity about their recent campaigns amongst cleaning workers. This article is abridged from a much longer interview, available online here. Terry Liddle, who died of a stroke on 18 November aged 64, will be best known to readers of Solidarity for his activity in the Socialist Alliance and its successor groups in the early 2000s. This was however only part of a rich life in revolutionary politics stretching back over 50 years in South East London. He joined the Young Communist League in the early 60s, was briefly in Healy’s Socialist Labour League, and then became a libertarian Marxist, open to and with links to anarchism, remaining active on the left until his death despite a long period of poor health. Behind the current global capitalist crisis is a snapback in the shifting balance between creditors and debtors. A recent US court ruling about Argentina's payments on its bonds (IOUs) marks a sharper snap, with large potential ricochet effects. After defaulting (ceasing to make payments due) on its bonds in 2001, Argentina worked out a deal with most of the bondholders to cancel the old bonds and replace them by new ones with a smaller payback. Workers’ Liberty brought together spoken-word artists, performance poets, rappers, and other musicians on Saturday 24 November in Kings Cross for the fourth edition of “Beats, Rhymes, & Picket Lines”, an occasional night of music and poetry to raise money for ongoing working-class struggles, as well as AWL itself. The exact facts surrounding the political row about the UKIP-member foster carers from Rotherham are unclear. No child, whatever their background, should be fostered by racists. It is the thankless job of social workers to ensure that doesn’t happen; mistakes are bound to be made. In Rotherham, where this week a by-election to replace expenses-fiddling Labour MP Denis MacShane takes place, every politician has declared that a mistake has indeed been made. But how do they know that? Are they childcare professionals with access to the confidential information?